Welcome to the Caging options that Therian can offer you! Mason Company’s Quiet Cottages™ are a warmer, quieter, more attractive alternative to cold, loud, and institutional looking metal cages. Manufactured with durable fibreglass materials, the units are the perfect choice for facilities that desire upscale housing instead of stainless steel. 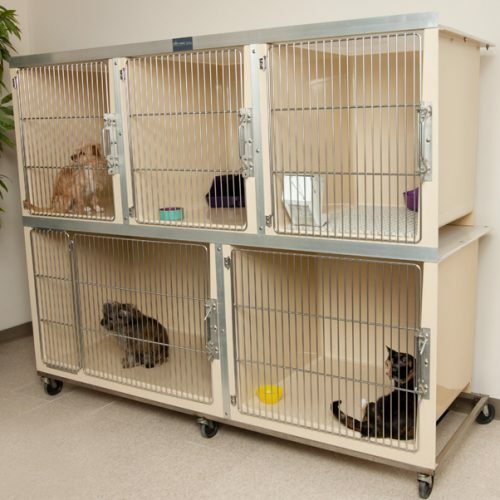 The modular cage units are interchangeable and easily configured to maximise an animal holding area. They are constructed with an SUS304 stainless steel door and frame, and 201 stainless steel classic single-hand lock. These modular cage banks are a perfect cost effective addition to your clinic.